A purchase order can have 4 different statuses. Open – Open means that the PO has not yet been sent to the vendor and the items are not put ‘On Order’ in inventory. Issued – Means that the vendor has received a copy of the purchase order. With the correct security permissions the user can un-issue and then edit the PO. If un-issuing a PO, care should be taken to make sure that the vendor has the correct copy of it. When the PO is issued and sent to the vendor the items on it get the ‘On Order’ quantity increased and the PO number gets saved to the ‘PO No” field in inventory. Received – Means that this PO has had some product received on it. It can be un-issued and edited, but the lines that have had products received cannot be changed. Enter in the vendor’s invoice number, date of the invoice and edit the terms as required. The values can also be edited but if it does not match the received amount of the PO then the difference will be posted to the ‘Inventory Variance’ GL account that was set in Company Settings/Special Accounts. If the user does not enter an AP invoice, the inventory GL account still gets debited, but credit goes to the ‘Accrued Purchases’ account that was setup in Company Settings/Special Accounts. When the accounts payable invoice is eventually entered via the purchase order it will debit the accrual and credit accounts payable. 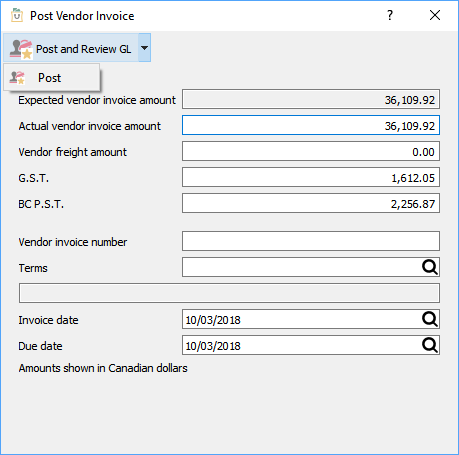 !Note – If the user enters the the vendors invoice in accounts payable instead of through the PO then the accrual will not automatically be reversed. Click Here for more details. If the user has the setting Purchase Orders/Close Purchases then once the vendor invoice is posted the user will be asked if they want to close the purchase order. If the amount of the accruals received on the PO do not match the amount posted to AP then the remaining amount will get posted to the GL account setup as ‘Inventory Variance’ in company settings. Hold – PO is on hold and cannot be edited. Standing – A repeat purchase order that once closed stays in the PO list so user can issue it again.